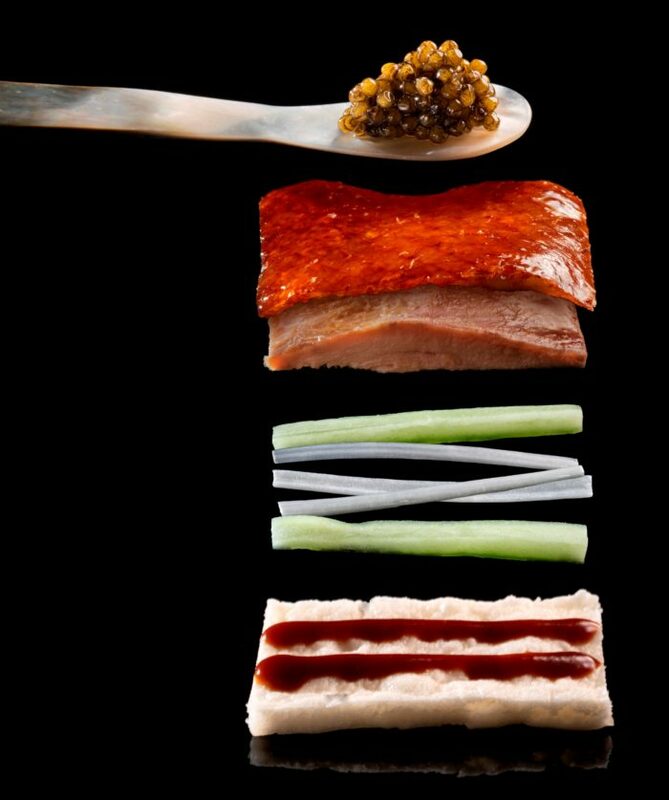 The award-winning Cantonese restaurant created by the Hakkasan Group, will officially open its doors at Atlantis, The Palm on Tuesday 23rd October 2018. Already established as a leading destination for modern Cantonese cuisine in the city, the restaurant will feature a stylish restaurant and bar, a new menu presenting exclusive dishes to the restaurant as well as a selection of special experiences and weekly events. Located at the entrance to The Avenues, Hakkasan Dubai will feature an intimate restaurant and vibrant bar, segregated by intricate carved wooden screens and latticing; which echo the rich and glamorous interiors of the London flagship restaurant. Calmness, tranquility, and humility are translated into an elegant atmosphere true to Hakkasan’s Chinese roots. The menu will feature signature dishes served in the traditional sharing style Hakkasan approach as well as a selection of dishes exclusive to the Dubai location. Signature dishes will include Peking duck served with Royal Beluga caviar, grilled Chilean sea bass cooked in honey and the famous stir-fried black pepper rib-eye beef. New and exclusive Dubai dishes will include crispy roasted chicken with garlic and sesame, osmanthus Wagyu beef rib eye and wok-fry Australian rack lamb with black garlic. Hakkasan Dubai will also host a range of special experiences and weekly events including a daily Taste of Hakkasan menu, a Friday brunch and the signature Hakatini night. A must do for residents and visitors of Dubai, the Taste of Hakkasan menu starts at AED 318 per person and is available daily from 6:00PM-7:30PM. Including sake by tokkuri, the curated menu includes signature dishes such as the supreme dim sum platter, roasted truffle duck with mushroom tea tree and a decadent dessert selection handpicked by the chef. Culinary aficionados should also keep a look out for the weekly Hakkasan Friday brunch, set to launch later this year. With prices starting from AED 328 per person, this sophisticated and stylish brunch experience will feature Hakkasan’s favourite dishes, DJ, creative cocktails as well as many surprises yet to be announced. Hakkasan Dubai will be open daily for dinner from 6pm-11.30pm. The bar will be open from 5pm-1am. Dress code is smart casual, and jeans are permitted as long as they are worn smartly with shoes and a collared shirt. The main dining area is open to guests of all ages until 7PM. After 7PM, guests must be 10 years of age or older. Complimentary valet parking is provided. For general enquiries or to make a reservation please call +971 4 426 26 26 or email hakkasan@atlantisthepalm.com. More information can be found at https://www.atlantisthepalm.com/restaurants/hakkasan and https://hakkasan.com via Instagram @hakkasandxb. Atlantis, The Palm is the first entertainment resort destination in the region and located at the centre of the crescent of The Palm in Dubai. Opened in September 2008, the unique ocean-themed resort features a variety of marine and entertainment attractions, as well as 17 hectares of waterscape amusement at Aquaventure Waterpark, all within a 46-hectare site. It is home to one of the largest open-air marine habitats in the world, with over 65,000 marine animals in lagoons and displays including The Lost Chambers Aquarium, a maze of underwater corridors and passageways providing a journey through ancient Atlantis. Aquaventure features 18 million liters of fresh water used to power thrilling waterslides, a 2.3-kilometer river ride with tidal waves and pools, water rapids and white-water chargers. Dolphin Bay, the unparalleled dolphin conservation and education habitat, and Sea Lion Point were created to provide guests a once in a lifetime opportunity to learn more about one of nature’s most friendly mammals. Atlantis, The Palm is also known as the culinary destination in the region with a collection of world-renowned restaurants including Bread Street Kitchen & Bar, Nobu, and Ronda Locatelli. The resort boasts an impressive collection of luxury boutiques and shops as well as extensive meeting and convention facilities. Established in 2001 in London, Hakkasan now has 11 restaurants around the world located in the United States, Europe, Middle East, India, and Asia. Hakkasan offers guests a world-class culinary experience helmed by Michelin-starred chefs: Executive Head Chef Tong Chee Hwee and International Executive Chef Ho Chee Boon. The menu is a modern interpretation of authentic Cantonese cuisine, using the finest ingredients and expert techniques to create timeless yet innovative signature dishes.